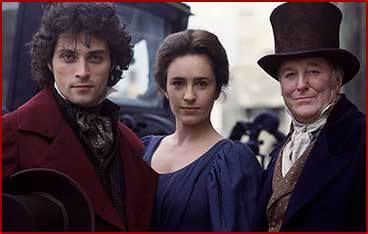 After watching “MIDDLEMARCH”, it occurred to me it is one of the best miniseries that came from British television in the past twenty to thirty years. I also believe that it might be one of Andrew Davies’ best works. Mind you,“MIDDLEMARCH” is not perfect. It has its flaws . . . perhaps one or two of them . . . but flaws, nonetheless. While watching “MIDDLEMARCH”, I got the feeling that screenwriter Andrew Davies could not balance the story arcs featuring Dorothea Brooke and Tertius Lydgate with any real equilibrium. It seemed that most of his interest was focused upon Lydgate as the saga’s main character, instead of dividing that honor between Lydgate and Dorothea. While the miniseries revealed Dorothea’s unhappy marriage to Casaubon, Davies’ screenplay in the first three episodes, Davies did a first rate job in balancing both hers and Lydgate’s stories. But Lydgate seemed to dominate the second half of the miniseries – the last three episodes – as his story shoved Dorothea’s to the status of a minor plot arc. Mind you, I found the Lydgates’ marriage fascinating. But Davies failed to deliver any real . . . punch to Dorothea’s story arc and especially her relationship with her cousin-in-law, Will Ladislaw. If I have to be honest, Dorothea and Will’s relationship following Casaubon’s death struck me as rushed and a bit disappointing. Yes, “MIDDLEMARCH” has a few flaws. And the photography featured in the latest copy seems a bit faded. But I believe that it is, without a doubt, one of the finest British television productions from the last twenty to twenty-five years. After all of these years, I have a much higher regard for it than when I first saw it.